Oil on panel, 33 x 43,5 cm. Adriaen van Ostade devoted most of his art to the depiction of the Dutch agricultural class. While his earlier works primarily depicted peasants as rude, vulgar and wild patrons at local taverns, his later paintings suggest a better understanding of the many facets of rural life. 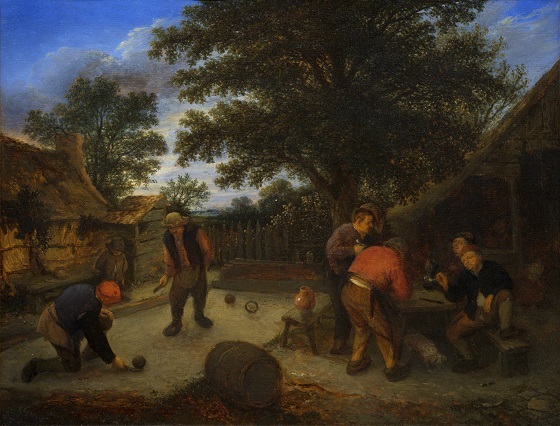 This painting shows how the artist began to incorporate the pastimes of Dutch peasants into his range of subjects with great interest and insight. Under a large tree in a cosy tavern courtyard, two men are in the middle of a pleasant game that involves rolling a ball through a ring.